Russia is leaving the dictatorship of the market where oil goods are based on the dollar and won't back down in face of a drastic drop in world prices on energy resources, Russian President Vladimir Putin said Friday. MOSCOW, November 14 (Sputnik) – Russia plans to leave the “dollar dictatorship” of market oil prices and turn to using the country’s national currency and the Chinese yuan, Russian President Vladimir Putin said Friday. “We are leaving the dictatorship of the market where oil goods are based on the dollar and will increase the possibilities of using [other] national currencies: the ruble and the yuan,” Putin said in an interview with the Russian state news agency TASS. On a November 9 meeting on the sidelines of the APEC summit Putin and Chinese President Xi Jinping discussed the possibility of using the yuan in transactions in fields of mutual cooperation. Putin said in his Monday speech at the Asia-Pacific Economic Cooperation (APEC) summit in China that accounting in the ruble and yuan will most likely weaken the dollar’s influence on the global energy market. Putin added that possibilities to increase the use of the Russian and Chinese currencies in bilateral trade, particularly in the energy sector, were being studied. Russian authorities have not excluded the possibility of a drastic drop in world prices on energy resources but are still prepared to uphold the country’s social obligations and economy, Russian President Vladimir Putin said Friday. “We’re considering all of the different scenarios, including a so-called catastrophic drop in the prices of energy resources, which is completely possible, we acknowledge this,” Putin said. “We are an oil and gas producing country and we treat our reserves carefully. They’re large enough and this allows us to be sure that we will fully fulfill all of our social responsibilities and will uphold all of the budget processes within definite frameworks and throughout the entire economy,” he told the Russian state news agency TASS in an interview. The Russian leader added that sometimes the global economy faces imbalances of capital on the one hand, and commodities on the other hand, which may appear due to political considerations. The countries with emerging economies get into very difficult position during those times, especially those, which do not possess reserves similar to Russia’s. “I’d like to say once again that I expect us to have a joint discussion and seek a joint solution on how to change things for the better and eliminate these imbalances,” Putin said. In recent months Russia's economy has been showing signs of a minor slowdown due to geopolitical tensions and Western sanctions over Russia's alleged role in the Ukrainian crisis. As a result of falling oil prices, the Russian ruble has fallen 23 percent against US dollar in the past three months. In October, Russian Economic Development Ministry increased predicted inflation rates for 2014, setting the forecast for this year to 7.2 percent from the original 6 percent. Financial examination demonstrates that Russia's major oil company Rosneft is not in financial difficulty, Russian President Vladimir Putin said on Friday. "Recently, we checked the financial standing of Rosneft and didn't find any problems there whatsoever. No financial problems at all," Putin said in an interview with the Russian state news agency TASS. In October, Russia's Finance Minister Anton Siluanov said that Rosneft had asked for over 2 trillion rubles ($42 billion) from Russia's National Wealth Fund to help withstand Western sanctions. Putin stated that if the company needs more money, it must prove that the funds will be spent in such a way that there will be returns for the entire economy. "I'd like to stress once again that if they need more money they must prove that these funds… will be spent for specific purposes and there will be returns for the entire economy, on top of returns for the company," Russian leader explained. Putin did not rule out the possibility that Rosneft could receive funds if necessary, but not before all the relevant factors are carefully examined. "This will be a real assessment and I don't rule out that Rosneft may get some funds. Yet the amount of such allocations and the terms require a thorough analysis. No hurry here," Putin said, adding that he has already participated in discussions on this topic with Government Cabinet members and company heads. "If I were a Rosneft CEO, I would ask for money, too. Why not? Who doesn't ask for it today? Everyone's asking for money and hoping to get it. The Government Cabinet – I know their position because I discussed it both with the Cabinet and Rosneft – will make a decision based not just on the needs of the company which we truly treasure and which we will definitely help," Putin concluded. Rosneft is a Russian oil giant, and one of the leaders in the country’s petroleum industry. The company's activities include hydrocarbon exploration and production, offshore projects, hydrocarbon refining, and crude oil, gas and product marketing in Russia and abroad. The Russian government is not going to use reserve funds to solve current economic problems without carefully considering that it will have a positive outcome for the country's entire economy, Russian President Vladimir Putin said Friday. "Strictly speaking, we were planning this before, and in the current deteriorating conditions we will do so. But it does not mean that we should 'burn' these reserves without even thinking, not expecting adequate economic outcomes, only to solve the current problems," Putin said. In an interview with Russian state news agency TASS, the Russian president noted that government funds had been available "before all those negative events connected with the fluctuations in the ruble's exchange rate or the fall in oil prices". At the same time, the president has noted that there is no need to use those funds to accelerate the Russian economy. "If the funds are used, it will be done in several ways. One of them is the infrastructure development. That is exactly what we were planning to use the NWF [National Wealth Fund] money for," Putin added. On October 2, Russian Finance Minister Anton Siluanov said authorities had no plans to use resources from the Reserve Fund in 2015, but retained the right. Nevertheless, in mid-October, Russian President Vladimir Putin stated Russia had enough reserves to meet state budget goals, regardless of global political and economic trends. He added the country's budget could be adjusted to reflect fluctuations in oil prices, but vowed social spending would not be cut. The United States does not implement decisions agreed at the G20 summit if they are not in line with its own interests, thus risking irrelevance in the global arena, Russian President Vladimir Putin stated Friday. In particular, according to the Russian president, it concerns the decision on strengthening the role of emerging economies in the IMF with the redistribution of quotas. "The US Congress blocked that decision and that's all. The negotiators, our partners, are saying: well, we would be happy [to do that], we did sign it, but the Congress does not let it through. So much for decisions," Putin told the Russian state news agency TASS in an interview. The Russian president added that the decision "shapes the international public opinion" as all the G20 countries and international actors find the decision reasonable and right. As for US Congress’ refusal to pass the law on the redistribution of IMF quotas, it "indicates that the United States is dropping out of the general context of resolving the problems facing the international community. But nobody cares to remember this. Assuming its monopoly on world mass media, this information is hushed up. An impression is made that it does not really exist," Putin said. Putin also noted that the G20 forum is still relevant. "The G20 is a good platform to meet each other, discuss both bilateral relations and global problems, and develop at least some sort of common understanding what this or that problem is all about, and how to resolve it, to make a road map for joint work." "This is the most important thing because it is totally unrealistic to expect that everything that may be said there will be implemented, especially since the decisions themselves are not mandatory. To a certain degree they are neglected. And they are not observed whenever and wherever they are not in line with somebody’s interests. First and foremost, this is about the interests of global players," the Russian president said. Answering a question about whether decisions made at the G20 summit could be made mandatory, Putin said it is "impossible." "You know that there have been no such precedents in international practice. Except for the UN Security Council decisions regarding international security. But that procedure was generated in the very dramatic conditions of the bloody World War II. It is just unrealistic to expect that these days some new mechanisms may be established to enforce compliance with decisions, let alone decisions concerning economy. Let me say once again, all this is of moral, political and economic nature. Which in itself is not bad at all," the Russian president said. On November 15-16, Putin will visit Brisbane, Australia for the ninth G20 summit, which will see up to 4,000 delegates attending. The summit will focus on the recovery from the global financial crisis, climate change, employment and labor mobility, among other topics. Russian President Vladimir Putin on Friday said he would not bring up the issue of sanctions during the G20 summit in Australia on November 15-16 and believes the sanctions imposed against Russia are the West's geopolitical mistake. "If the subject comes up, then of course I'll say something, but personally I'm not going to bring this issue [sanctions] up for discussion because I think it's useless," Putin said. "I believe this is a mistake even from the point of view of their [Western countries] geopolitical interests," he told the Russian state news agency TASS in an interview. On November 9, on the sidelines of the Asia-Pacific Economic Cooperation (APEC) summit in Beijing, the Russian president spoke about the necessity to consider Asian markets and currencies to partially substitute access to the financial resources of the European Union and the United States. The United States, the European Union and a number of other countries have introduced several rounds of economic sanctions against Russia, targeting its banking, energy and defense sectors in response to the country’s alleged role in the Ukrainian conflict, an accusation Moscow has repeatedly denied. Russia imposed a one-year ban on certain food imports from those countries. On November 15-16, the city of Brisbane in Australia will host the ninth G20 summit, which will see up to 4,000 delegates attending. The summit will focus on the recovery from the global financial crisis, climate change, employment and labor mobility, among other topics. Russian President Vladimir Putin said that he has scheduled several bilateral meetings in the framework of G20 summit in Australia, including the one with German Chancellor Angela Merkel. The G20 summit will take place on November 15-16 in the Australian city of Brisbane. A morning before the official ceremony, leaders will hold an informal meeting to discuss current situation in the global economy, existing risks, threats and possibilities to overcome those. “I have scheduled meetings there. 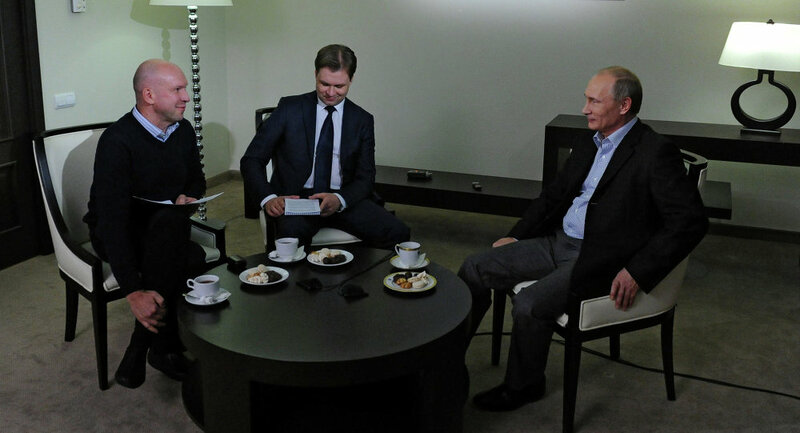 With the German Chancellor… a lot of meetings,” Putin said in an interview with the Russian state news agency TASS. Earlier it was reported that Putin also plans to meet with UK Prime Minister David Cameron and French President Francois Hollande. In his interview, Russian leader added that existing problems and misunderstandings have not had an impact on his relations with Merkel. “You know that we are guided by interests instead of sympathies and antipathies… And she had also been guided by same interests, just like any other leader of a nation, state or government. This is why I see neither considerable changes nor any substantial alterations in the nature of our relations,” Putin said. The Russian leader and the German Chancellor have been holding frequent talks amid the Ukrainian crisis and the approaching deadline to reach Iranian nuclear agreement. While Putin and Merkel hold phone conversations every couple of weeks, the last time when they held bilateral meeting was during the ASEM summit in Milan in October. The leaders share similar views toward many situations, however their approach to conflict in Ukraine differs. Merkel supported European Union's sanctions against Russia over Ukrainian crisis, blaming Moscow for meddling in Ukrainian internal affairs — a claim Moscow repeatedly denied. In November, German Chancellor refused to lift anti-Russian sanctions, saying that Russia's approval of the elections in Donetsk and Luhansk People's Republics in eastern Ukraine contradict the Minsk agreements on crisis settlement.